Our range of products include amlodipine tablet, cilnidipine tablets, hydrochlorothiazide tablets and benidipine hydrochloride. Amlodipine is in a group of drugs called calcium channel blockers. Amlodipine relaxes (widens) blood vessels and improves blood flow. Amlodipine is used to treat high blood pressure (hypertension) or chest pain (angina) and other conditions caused by coronary artery disease. Dizziness, lightheadedness, swelling ankles/feet, or flushing may occur. If any of these effects persist or worsen, tell your Doctor. Cilnidipine 20,10,5 MG Tablet is a medicine belonging to the calcium channel blocker group. This medicine relaxes the blood vessels and is used for the management of high blood pressure. This medication is used to treat high blood pressure. Lowering high blood pressure helps prevent strokes, heart attacks, and kidney problems. 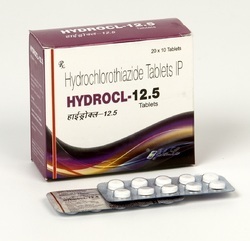 Hydrochlorothiazide works by causing you to make more urine. This helps your body get rid of extra salt and water. This medication also reduces extra fluid in the body caused by conditions such as heart failure, liver or kidney disease. This can symptoms such as shortness of breath or swelling in your ankles or feet. Upset stomach, dizziness, or headache may occur as your body adjusts to the medication. If any of these effects last or get worse, tell your doctor. 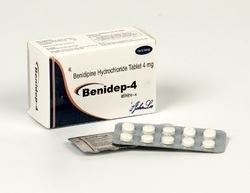 Benidipine, is a dihydropyridine calcium channel blocker that is used for the treatment of high blood pressure. This medication is used to prevent nausea and vomiting caused by cancer drug treatment (chemotherapy) and radiation therapy. It is also used to prevent and treat nausea and vomiting after surgery. It works by blocking one of the body’s natural substances (serotonin) that causes vomiting. Headache, light headedness, dizziness, drowsiness, tiredness, or constipation may occur. If these effects persist , notify your doctor promptly.